Mr Sticky Fingers Cake Co and I had a lovely week in Devon after the last wedding cake so were back, refreshed, raring to go and back in the kitchen to create Lauren and Joshua’s pretty three tier iced wedding cake for their wedding at The Lawn, Rochford. 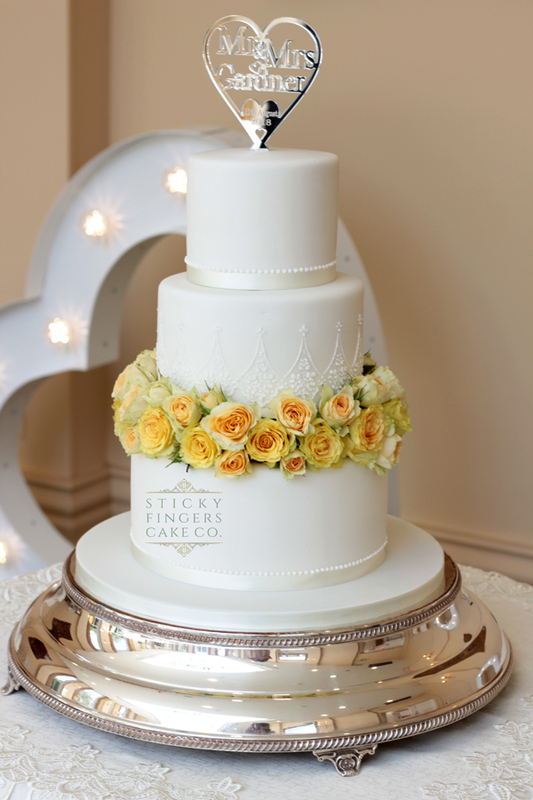 Their wedding cake was decorated simply with a royal iced piped stencil effect on the middle tier, with the middle and top tiers sitting on a ring of fresh lemon roses, supplied by their florist. It looked absolutely stunning! Super-scrummy flavours of Black Forest, Traditional lemon and White Chocolate and Passion Fruit. Congratulations guys, hope you had the best day ever!